This replacement magazine is a factory original from Smith & Wesson. Factory replacement parts are manufactured to the exact same specifications and tolerances and use the same manufacturing materials as the original parts which guarantees excellent fit and reliable operation. This magazine will fit the M&P Compact however it will stick out further than normal from the magazine well. Keeping a few extra factory magazines around is never a bad idea; extra magazines save loading time at the range and also serve as a backup for those days when you simply cannot remember where you put your primary magazine. 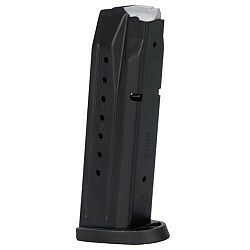 -This follower is stamped with "9"
Restrictions are observed in the following cities and/or states prohibiting the sale or shipment of magazines with more than a 10rd capacity to: Aurora, Il; Chicago, Il; South Bend, IN; All of CA; All of HI; All of MA; All of NJ; All of NY. 15rds Restricted in CO.